The euro came under renewed pressure and fell against the dollar after a slight correction, but within the formed side range. The Germany producer price index (PPI) fell more than expected in December, -0.7% m/m, -1.7% y/y, while it was forecasted to see -0.4% m/m, -1.4% y/y vs. 0.0% m/m , -0.9% y/y in November. The foreign exchange market is frozen in anticipation of the important week events. The pair EUR/USD remains under pressure, but it slightly increased to the resistance level of 1.1600-1.1620. In general, the situation remains unchanged, the downtrend remains in force. The support levels are 1.1500-1.1520, and the resistance levels are 1.1600-1.1620. Tomorrow there are risks of profit taking on short positions after the ECB meeting and/or Mario Draghi press conference results. At this stage it is better to stay out of the market. The pound was in the sales wave and leveled all the losses that incurred against the dollar during the previous session. The unemployment rate as defined by the ILO standards probably fell to 5.9% from 6% in November and the jobless claims requirements fell by 24.2 thousand. It is expected the average salary increase up to + 1.9% y/y from + 1.6% g/g previously. The pair GBP/USD still cannot determine its direction. The pair uncertainty can be attributed to a lack of updated drivers, which may become the BoE’s minutes publication and the UK macroeconomic statistics. On the fall to the support near 1.5080-1.5100 the pair was sold off and it returned to the resistance near the 52nd figure. 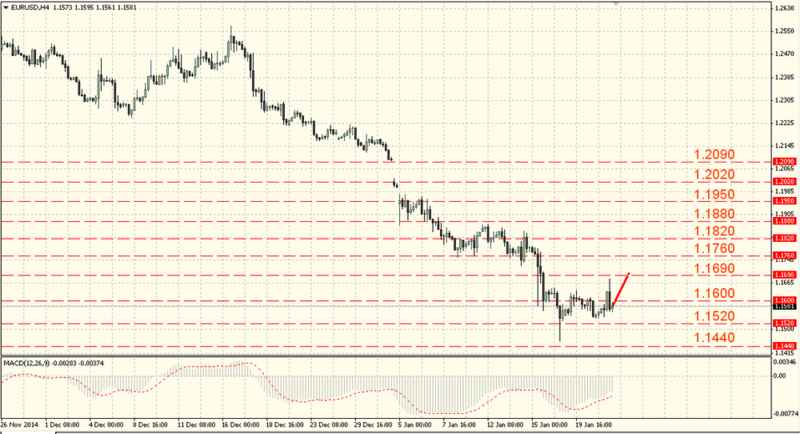 Thus, the pair continues to consolidate in the range after falling to the support near 1.5080-1.5100. 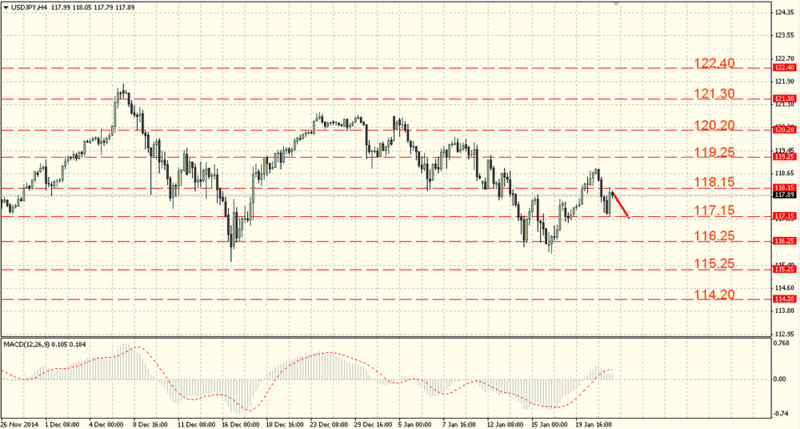 The support levels: 1.5080-1.5100 and the resistance levels: 1.5160-1.5180. The MACD indicator is in a neutral territory. The 52nd figure breakthrough will open the way to the 53rd figure. The support loss will lead to the level of 1.4970-1.4990 testing. The US dollar is declining against the yen and the reason is the Bank of Japan decisions which appeared after the next Japanese regulator meeting. The Bank of Japan governor Kuroda noted that the consumer price inflation can slow down from this point amid the sharp oil prices decline. The pair dollar/yen continued to grow. Breaking through the resistance near the 118th figure, the pair managed to rise above the level of 118.15-118.35 which withstood the bulls’ attack. Once being under pressure from the sellers’ part, the pair returned below the 118th figure and tested the mark of 116.95-117.15. The support levels: 116.95-117.15, and the resistance levels: 118.15-118.35. Its inability to consolidate above 118.15-118.35 is a wake-up call for the bulls, but as long as the pair is trading above 116.95-117.15, the chances for the growth resumption will be preserved. The loss of 117th figure will cast doubt the bulls’ ability to keep the situation under control.